A dog is a man’s best friend. They wag their tail and enter your lives with such warmth and joy. The puppy eyes melt your heart and make you want to hug them tight. While your dog brings sheer joy in your life, it is your responsibility to take good care of your pooch. There are times when we are not home and that’s when we worry about the feeding time. Who will feed your dog? You cannot let the dog go hungry for several hours a day. However, office hours do not allow us to spend the entire with our dogs. We know what you need! 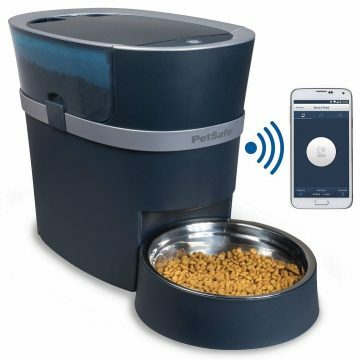 How about getting an automatic dog feeder? Since your dog means a world to you, we have listed the Top 10 automatic dog feeders which are easily available on Amazon. Take a look at the list as you have many options as per your budget and requirement. 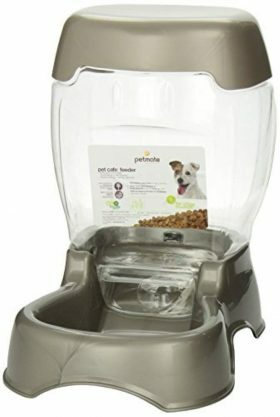 The Westlink automatic food dispenser makes feeding stress-free and hassle-free for pets such as cats and dogs. It can hold up to 4 meals of the day which means you can leave your pooch behind for several hours without worrying about him going hungry. Each portion is about 10-12g and It has a voice recorder as well. Your pet recognizes your voice and so, you can record a 10-second message to call them for their meals. With this product, there are no spills as it has a built-in infrared detection where the food does not get locked and there is no spilling. 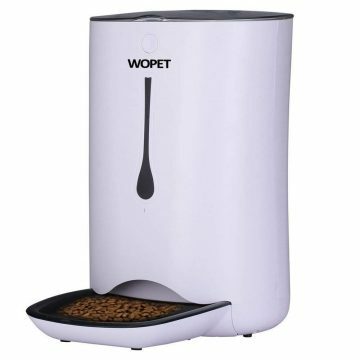 WoPet 7L pet feeder can offer 4 feedings in a day. 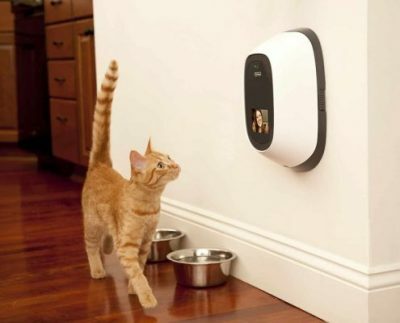 It has a built-in timer which makes sure that your pet never goes hungry. 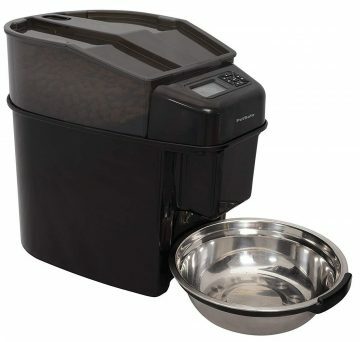 There is an LCD screen through which you can set the meals for your dog or cat. It is a battery or wall powered machine which never goes off in cases of power failure. One can control the portion sizes easily through this efficient product. The good news is that you can record a custom message for your dear pet. That’s not all! It has a large storage compartment as well. 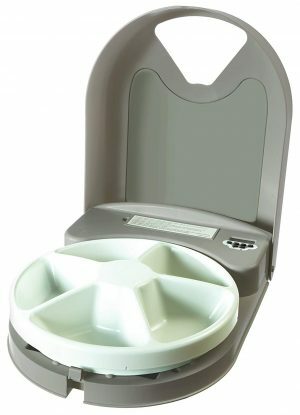 PetSafe pet gravity dog and cat food station allow you to feed your dog at all times of the day. Whether it is day or night, your munchkin gets access to food all day. It has a sturdy construction which prevents spills and knocks overs. Since it is easy to clean, we would recommend you to opt for this product. The bowl I hygienic and is made of stainless steel. What else would one want? Bergan Gourmet makes sure that your pet never goes without water or Food. This gourmet combo is everything that you need to store the food for your pet. It has 6lb capacity and is very simple to fill and refill. Cleaning is never an issue with this product. You can trust it completely! The product is BPA free and avoids spilling and splashing. Pet Safe is a brand which does not need an introduction. Pet parents trust the products of this brand. 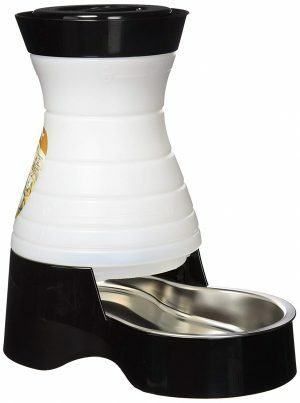 This particular product has a large capacity and can hold up to 24 cups of dry cat and dog food. You can customize the meal times as per your wish. The flexibility of portions is what makes it a great product. You can control the portion as per the size of the dog. It has a great design which prevents jams and spills. The pet proof dispenser keeps the food fresh and tasty for your little one. 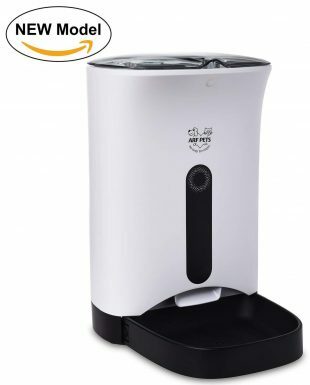 The product is easy to clean and since it is battery powered, you can be free from the stress of power failure. 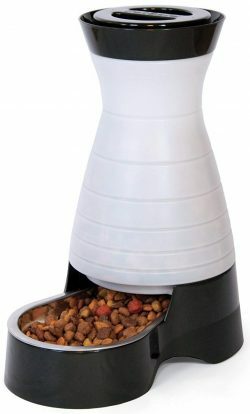 PetSafe smart feed food dispenser for dogs and cats is trending as of now. It is a hot product in the market as the reviewers on Amazon have given excellent reviews. There is smartphone programming which ensures that you can control the feeding through your android phone or iPhone. The flexibility of portions makes it an ideal product. In fact, the pet parents receive alerts and you can easily monitor the pet feedings. The product has a reliable design and a power adapter is included as well. PetSafe is one of the leading brands in the U.S. and one can never go wrong with it. PetMate pet café feeder automatically feeds your dog when the level of the food reservoir goes low. There is a removable lid through which you can refill and easily clean up the product. The product has easy grab cutouts. You would be happy to know that the product is environmentally sustainable. 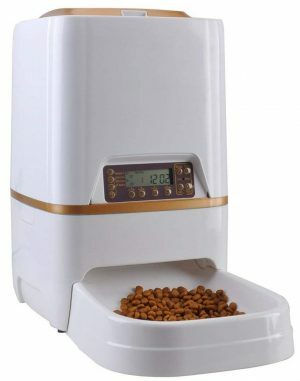 Arf Pets automatic pet cat and dog food dispenser are meant for those who stay away from home most of the time. It is also meant for the dietary well being of your dogs. It can dispense 1-10 portions per meal in a day and each meal is about 24ml. It has a magnetic lock lid and a bright LCD clock which lights up. You can even record a message for about 10 seconds to call your dog or cat for their meals. 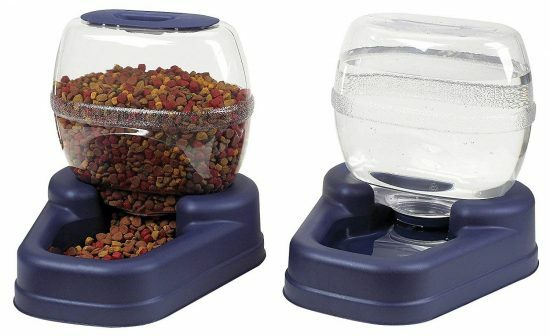 PetSafe healthy pet cat and dog food station can hold up to 2lb of food. Since it has a sturdy construction, it helps in preventing spills and knock overs. You may have a naughty munchkin in your home but this device does not shake and avoid spills. The bowl included is made of stainless steel and is healthy for your pet. We love it when there is a responsive customer support team and well, you can reach the brand by call or email anytime! PetSafe 5 meal pet feeder holds 5 meals for your little pooch. You can travel and work without any stress because this product automatically feeds your pet a pre-proportioned meal and he or she never goes hungry. The product is easy to set up and since there is a proportion control, it prevents overeating. We all know that when a dog overeats, he/she may get sick and vomit. The product is easy to clean and is battery powered. You never have to worry about power failure. Your dog will never starve. The automatic feeder is smart technology and knows when your dog needs food. You will have a happy and well-fed dog at home! Look at your dog’s eyes! They want to be loved and cared for. Since they love you unconditionally, it is your duty to take special care of your pooch. He/she is not asking for stars but you can make sure that they were fed even when you are not around. All the above-mentioned products are available on Amazon. You can compare the ratings and reviews of each. We know that you are going to buy the best one!